Discussions Magazine Music Blog: PETE TOWNSHEND: An EXCLUSIVE interview! 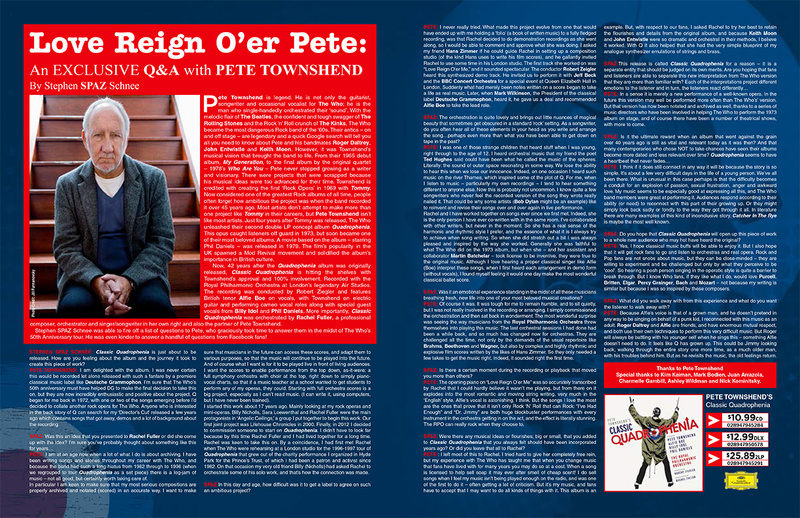 PETE TOWNSHEND: An EXCLUSIVE interview! Pete Townshend is legend. He is not only the guitarist, songwriter and occasional vocalist for The Who; he is the man who single-handedly orchestrated their ‘sound’. With the melodic flair of The Beatles, the confident and tough swagger of The Rolling Stones and the Rock ‘n’ Roll crunch of The Kinks, The Who became the most dangerous Rock band of the ‘60s. Their antics – on and off stage – are legendary and a quick Google search will tell you all you need to know about Pete and his bandmates Roger Daltrey, John Entwistle and Keith Moon. However, it was Townshend’s musical vision that brought the band to life. From their 1965 debut album, My Generation, to the final album by the original quartet – 1978’s Who Are You – Pete never stopped growing as a writer and visionary. There were projects that were scrapped because his musical ideas were too advanced for their time. Townshend is credited with creating the first ‘Rock Opera’ in 1969 with Tommy. Now considered one of the greatest Rock albums of all time, people often forget how ambitious the project was when the band recorded it over 45 years ago. 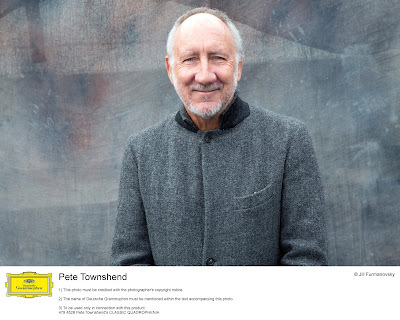 Most artists don’t attempt to make more than one project like Tommy in their careers, but Pete Townshend isn’t like most artists. Just four years after Tommy was released, The Who unleashed their second double LP concept album Quadrophenia. This opus caught listeners off guard in 1973, but soon became one of their most beloved albums. A movie based on the album – starring Phil Daniels – was released in 1979. The film’s popularity in the UK spawned a Mod Revival movement and solidified the album’s importance in British culture. Now, 42 years after the Quadrophenia album was originally released, Classic Quadrophenia is hitting the shelves with Townshend’s approval and 100% involvement. Recorded with the Royal Philharmonic Orchestra at London’s legendary Air Studios. The recording was conducted by Robert Ziegler and features British tenor Alfie Boe on vocals, with Townshend on electric guitar and performing cameo vocal roles along with special guest vocals from Billy Idol and Phil Daniels. 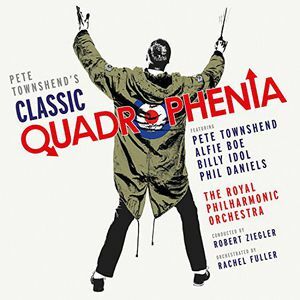 More importantly, Classic Quadrophenia was orchestrated by Rachel Fuller, a professional composer, orchestrator and singer/songwriter in her own right and also the partner of Pete Townshend. Stephen SPAZ Schnee was able to fire off a list of questions to Pete, who graciously took time to answer them in the midst of The Who’s 50th Anniversary tour. He was even kinder to answer a handful of questions from Facebook fans! STEPHEN SPAZ SCHNEE: Classic Quadrophenia is just about to be released. How are you feeling about the album and the journey it took to create this piece of work? 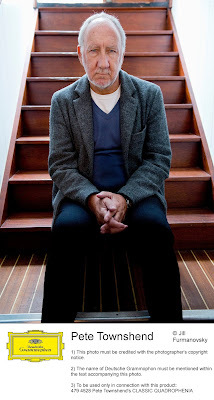 PETE TOWNSHEND: I am delighted with the album. I was never certain this would be recorded let alone released with such a fanfare by a premiere classical music label like Deutsche Grammophon. I’m sure that The Who’s 50th anniversary must have helped DG to make the final decision to take this on, but they are now incredibly enthusiastic and positive about the project. Q began for me back in 1972, with one or two of the songs emerging before I’d decided to collate another rock opera for The Who. Anyone who is interested in the back story of Q can search for my ‘Director’s Cut’ released a few years ago which contains songs that got away, demos and a lot of background about the recording. PETE: I am at an age now when a lot of what I do is about archiving. I have been writing songs and stories throughout my career with The Who, and because the band had such a long hiatus from 1982 through to 1996 (when we regrouped to tour Quadrophenia as a set piece) there is a log-jam of music – not all good, but certainly worth taking care of. In particular I am keen to make sure that my most serious compositions are properly archived and notated (scored) in an accurate way. I want to make sure that musicians in the future can access these scores, and adapt them to various purposes, so that the music will continue to be played into the future. And of course what I want is for it to be played live in front of living audiences. I want the scores to enable performance from the top down, as-it-were: a full symphony orchestra with choir at the top, right down to simply piano-vocal charts, so that if a music teacher at a school wanted to get students to perform any of my operas, they could. Starting with full orchestra scores is a big project, especially as I can’t read music. (I can write it, using computers, but I have never been trained). I started this work about 17 years ago. Mainly looking at my rock operas and mini-operas. Billy Nicholls, Sara Loewenthal and Rachel Fuller were the main protagonists in ‘Angelic Ceilings,’ a group I put together to begin this work. Our first joint project was Lifehouse Chronicles in 2000. Finally, in 2012 I decided to commission someone to start on Quadrophenia. I didn’t have to look far because by this time Rachel Fuller and I had lived together for a long time. Rachel was keen to take this on. By a coincidence, I had first met Rachel when The Who were rehearsing at a London studio for the 1996-1997 tour of Quadrophenia that grew out of the charity performance I organized in Hyde Park for the Prince’s Trust, of which I had been a patron and activist since 1982. On that occasion my very old friend Billy (Nicholls) had asked Rachel to orchestrate some of his solo work, and that’s how the connection was made. SPAZ: In this day and age, how difficult was it to get a label to agree on such an ambitious project? PETE: I never really tried. What made this project evolve from one that would have ended up with me holding a ‘folio’ (a book of written music) to a fully fledged recording, was that Rachel decided to do demonstration recordings as she went along, so I would be able to comment and approve what she was doing. I asked my friend Hans Zimmer if he could guide Rachel in setting up a composition studio (of the kind Hans uses to write his film scores), and he gallantly invited Rachel to use some time in his London studio. The first track she worked on was “Love Reign O’er Me,” and it sounded spectacular. The conductor Robert Zeigler heard this synthesized demo track. He invited us to perform it with Jeff Beck and the BBC Concert Orchestra for a special event at Queen Elizabeth Hall in London. Suddenly what had merely been notes written on a score began to take a life as real music. Later, when Mark Wilkinson, the President of the classical label Deutsche Grammophon, heard it, he gave us a deal and recommended Alfie Boe to take the lead role. SPAZ: The orchestration is quite lovely and brings out little nuances of magical beauty that sometimes get obscured in a standard ‘rock’ setting. As a songwriter, do you often hear all of these elements in your head as you write and arrange the song…perhaps even more than what you have been able to get down on tape in the past? PETE: I was one of those strange children that heard stuff when I was young, right through to the age of 12. I heard orchestral music that my friend the poet Ted Hughes said could have been what he called the music of the spheres. Literally: the sound of outer space resonating in some way. We lose the ability to hear this when we lose our innocence. Indeed, on one occasion I heard such music on the river Thames, which inspired some of the plot of Q. For me, when I listen to music – particularly my own recordings – I tend to hear something different to anyone else. Now this is probably not uncommon. I know quite a few songwriters who never feel the recorded version of the song they wrote really nailed it. That could be why some artists (Bob Dylan might be an example) like to reinvent and revise their songs over and over again in live performance. Rachel and I have worked together on songs ever since we first met. Indeed, she is the only person I have ever co-written with in the same room. I’ve collaborated with other writers, but never in the moment. So she has a real sense of the harmonic and rhythmic style I prefer, and the essence of what it is I always try to achieve when song writing. So when she did stretch out a bit I was always pleased and inspired by the way she worked. Generally she was faithful to what The Who did on the 1973 album, but when she – and her assistant and collaborator Martin Batchelar – took license to be inventive, they were true to the original music. Although I love hearing a proper classical singer like Alfie (Boe) interpret these songs, when I first heard each arrangement in demo form (without vocals), I found myself feeling it would one day make the most wonderful classical ballet score. SPAZ: Was it an emotional experience standing in the midst of all these musicians breathing fresh, new life into one of your most beloved musical creations? PETE: Of course it was. It was tough for me to remain humble, and to sit quietly, but I was not really involved in the recording or arranging. I simply commissioned the orchestration and then sat back in wonderment. The most wonderful surprise was seeing the way musicians from the Royal Philharmonic Orchestra threw themselves into playing this music. The last orchestral sessions I had done had been a while back, and so much has changed now for orchestras. They are challenged all the time, not only by the demands of the usual repertoire like Brahms, Beethoven and Wagner, but also by complex and highly rhythmic and explosive film scores written by the likes of Hans Zimmer. So they only needed a few takes to get the music right. Indeed, it sounded right the first time. SPAZ: Is there a certain moment during the recording or playback that moved you more than others? PETE: The opening piano on “Love Reign O’er Me” was so accurately transcribed by Rachel that I could hardly believe it wasn’t me playing, but from there on it explodes into the most romantic and moving string writing, very much in the ‘English’ style. Alfie’s vocal is astonishing, I think. But the songs I love the most are the ones that prove that it isn’t only Rock ‘N’ Roll that can Rock: “I’ve Had Enough” and “Dr. Jimmy” are both huge blockbuster performances with every instrument in the orchestra getting in on the act, and the effect is literally stunning. The RPO can really rock when they choose to. SPAZ: Were there any musical ideas or flourishes, big or small, that you added to Classic Quadrophenia that you always felt should have been incorporated years ago? Or did you leave that all to Rachel? PETE: I left most of this to Rachel. I tried hard to give her completely free rein, but my experience with The Who has taught me that when you change music that fans have lived with for many years you may do so at a cost. When a song is licensed to help sell soap it may ever after smell of cheap scent! I do sell songs when I feel my music isn’t being played enough on the radio, and was one of the first to do it – often getting a lot of criticism. But it’s my music, and fans have to accept that I may want to do all kinds of things with it. This album is an example. But, with respect to our fans, I asked Rachel to try her best to retain the flourishes and details from the original album, and because Keith Moon and John Entwistle were so dramatic and orchestral in their methods, I believe it worked. With Q it also helped that she had the very simple blueprint of my analogue synthesizer emulations of strings and brass. SPAZ: On the other hand, was there something that you asked to remove since you didn’t think it ‘felt’ right? PETE: This happened a few times. But once Rachel got moving along, there were less and less doubts on my part. PETE: In a sense it is merely a new performance of a well-known opera. In the future this version may well be performed more often than The Who’s’ version. But that version has now been notated and archived as well, thanks to a series of music directors who have been involved in helping The Who to perform the 1973 album on stage, and of course there have been a number of theatrical shows, with more to come. SPAZ: Your participation obviously links this to the original recording. Phil Daniels starred in the movie version of Quadrophenia and appears here. How did you come to choose Alfie Boe –and Billy Idol – for this classical interpretation? PETE: Alfie was suggested by Mark at DG. Rachel and I were unsure a classical voice would work, but the minute we heard him we were convinced. He is a towering singer. I chose the other two reprobates! I knew Billy would do a great job, like Phil, he has been a part of the Q story all the way. PETE: I think if it does still connect in any way it will be because the story is so simple. It’s about a few very difficult days in the life of a young person. We’ve all been there. What is unusual in this case perhaps is that the difficulty becomes a conduit for an explosion of passion, sexual frustration, anger and awkward love. My music seems to be especially good at expressing all this, and The Who band members were great at performing it. Audiences respond according to their ability (or need) to reconnect with this part of their growing up. Or they might simply look back sadly or fondly to the way they got through it all. In literature there are many examples of this kind of inconclusive story. Catcher In The Rye is maybe the most well known. SPAZ: Does recording a new and refreshing take on your classic album offer you a new perspective on this piece of work that has been a part of your legacy for over four decades? PETE: I feel lucky to have been able to record Rachel’s entire score. I had told her I could probably record five tracks at the most – it’s a very expensive thing. I feel especially happy for Rachel who has lived in my shadow for a while. She is a brilliant orchestrator and a very clever and often amusing and ironic songwriter. I know she already has a commission for a film score, so she will be busy in the future. SPAZ: Do you hope that Classic Quadrophenia will open up this piece of work to a whole new audience who may hot have heard the original? PETE: Yes, I hope classical music buffs will be able to enjoy it. But I also hope that it will get rock fans to go and listen to orchestras and real opera. Rock and Pop fans are not snobs about music, but they can be close-minded – they are willing to experiment and be challenged but only by what they perceive to be ‘cool’. So hearing a posh person singing in the operatic style is quite a barrier to break through. But I know Who fans, if they like what I do, would love Purcell, Britten, Elgar, Percy Grainger, Bach and Mozart – not because my writing is similar but because I was so inspired by these composers. SPAZ: What did you walk away with from this experience and what do you want the listener to walk away with? PETE: Because Alfie’s voice is that of a grown man, and he doesn’t pretend in any way to be singing on behalf of a punk kid, I reconnected with this music as an adult. Roger Daltrey and Alfie are friends, and have enormous mutual respect, and both use their own techniques to perform this very difficult music. But Roger will always be battling with his younger self when he sings this – something Alfie doesn’t need to do. It feels like Q has grown up. This could be Jimmy looking back, walking through the entire story one more time, as a much older man, with his troubles behind him. But as he revisits the music, the old feelings return. SPAZ: What is next for Pete Townshend and the Classic Quadrophenia project? PETE: I perform it with the RPO at the Royal Albert Hall in London in July. I play guitar on a couple of things and take the role of the Godfather. Then I believe it will probably tour with Alfie taking in some real opera houses around the world. For me, I played opera houses with The Who when Tommy was released in 1969, this will feel like the closing of a circle. PETE: Hi Dave. Great to hear you are still so active. There have been a number of ‘echoes’ of what was most important about the Mod days in the early ‘60s. It was the music, and the dancing. The fashion became important, but that crazy Chubby Checker song “The Twist” allowed men to dance on their own. So when Mod came along soon after, young men were able to put a lot of machismo behind them and be who they really were. The 1979 revival was the most significant echo and your band, like The Jam, played a huge part. JORDAN OAKES: You reputedly invented the term “Power Pop”. What does the term mean to you? And are you aware of The Who's great influence on the genre, specifically in bands like the Raspberries and Cheap Trick? PETE: I suppose what I wanted to hear was pop music with some teeth, some edge, some passion. Power Pop is music that I think I’d describe as tight, hard and well organized as against Punk or Grunge. Cheap Trick are certainly that. JUSTIN FIELDING: Do you have any thoughts you’d like to share about the Power Pop genre (from then to now)? PETE: Well I still like it as a medium. The song I just wrote for the Who (“Be Lucky”) falls into that category I think. PETER SKIP BEAUMONT-EDMONDS: What was the working dynamic between yourself and Kit Lambert as a producer/mentor, versus Kit managing the band and his crazy excesses? PETE: He was a vital driver for me, encouraging me to work outside The Who prior to submitting my songs to them (so that they would stand being interpreted by such a wild musical gang). He inspired me to take chances, and to be what some critics call ‘pretentious’. He wanted me to be audacious and anarchic, to respect no traditions or boundaries and not to end up writing the same kind of song over and over again. In his management of the band he was delightful, and lived dangerously. He practiced what he preached to me, that’s for sure. PETER JACHIMIAK: In what ways does your Art School background still influence your musical creativity? PETE: I suppose having seen so many of the wildest predictions of my art school lecturers come true, I look to art lecturers and radical thinkers in the arts to predict what happens next. A lot of people look back at someone like Yoko Ono for example and fail to understand that in the mid-‘60s she was an agitator, a revolutionary, who used peaceful techniques to shock us into a reaction. Her message has always been about saving the world. Gustav Metzger was the same in the early ‘60s. Smashing a guitar may seem as pointless as singing inside a bag, but the point is that art itself has to find new ways of shaking people out of their stupor. I know a lot of people don’t agree, and I understand why, but they are wrong in my view. Art must shock, agitate and even irritate. It isn’t for putting on the wall. That is decoration, equally valid, but a very different thing. JEFF CORP: Tommy or Quadrophenia? Which is your best "rock opera," from your current perspective? PETE: Quadrophenia is better, but Tommy is probably more of a real opera. Neither are operas in the true sense; they don’t have recitative to help advance a story, but I am still working in this medium. Maybe the next one will crack it. BOB BELL/DAVID WIRTH: There are a number of tracks amongst your demo compilation releases (The Scoop albums), that have (mainly) full Orchestral String arrangements behind them. Are they part of a themed project that never came to fruition? It seems it would be an expensive endeavor to arrange and record demo songs randomly with an orchestra! PETE: You’re right. My ex-wife Karen Astley’s father was Edwin Astley, who was a film and TV composer. Very much like my own musician father and Kit Lambert, he was against any kind of snobbery in music – especially the classical world where the snobbery tends to be in the audience rather than the musicians and conductors. One day we decided to start a project together. Edwin had scored “Street In The City” for me, for the Rough Mix album I did with Ronnie Lane in 1977, and that was the style we were shooting for. Kit Lambert was meant to be producing. I’m afraid to say that Kit’s condition was even worse than it had been when I invited him to co-produce Q with me in 1973, so the project stuttered to a halt. Max Hole, now Chairman of Universal Records in Europe, has been pressing me to do an album like this, and I may consider it.